Ocean Blue Fishing Adventures started in Vanuatu with the first professional charter operation over 15 years ago… Now we have branched out across South East Asia and the South Pacific, allowing anglers to experience some of the most remote fishing destinations in this region. Ocean Blue Fishing Adventures have exclusive access to locations that are rarely fished by other anglers, perfect for the adventure of a lifetime. Our expert team can plan your dream expedition, whether it be casting poppers over a coral bommie, trolling for XOS Billfish, stripping a fly across an untouched aqua lagoon or jigging a remote seamount. We offer everything from half-day charters to live on board adventures, and we can tailor a trip to suit all requirements and budgets. There are 83 tropical islands which make up Vanuatu, home to some of the most remote and plentiful blue water game and sport fishing grounds anywhere.? There are under water seamounts, productive FADs, canyons and channels that are more often than not just a short distance offshore. At the same time there are productive reef systems which fringe most islands. You can expect to encounter a wide range of pelagic species, including massive black and blue marlin, as well as wahoo, dogtooth tuna, XOS yellowfin tuna, sailfish, mahi mahi and more. We offer half-day charters through to extended live on board adventures. If there’s adventure in your soul, then Fiji is the place to indulge it. Experience the action of wahoo, tuna, marlin and sailfish climbing all over your lures, cast poppers over coral reefs for giant trevally and coral trout, or drop jigs for monster dogtooth and yellowfin tuna. Fiji has it all – good year-round conditions, pristine waters, endless options and a large variety of species. 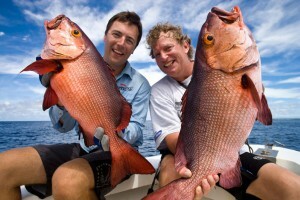 All this has established Fiji as one of the most productive sport fishing grounds in the Pacific. We can offer a day charter to compliment your family holiday, or a secluded private island resort for some serious sport fishing. The New Caledonian lagoon has a myriad of reef passages, inshore bommies and shallow aqua flats which are perfect for popping, jigging and fly tackle.? New Caledonia offers a huge variety of sport fishing targets, including monster GTs, red bass, coral trout, jobfish and many more. 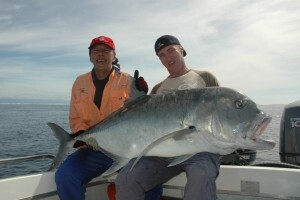 The ocean beyond the lagoon has spectacular popper fishing and jigging for dogtooth and yellowfin tuna. Other bluewater options include marlin, amberjack, sailfish, wahoo and spanish mackeral. As with our other charters we can organise trips from one day from Noumea to GT popping safaris all around New Caledonia. Kuala Rompin is becoming renowned as one of the world’s best light tackle sailfish destinations. Here you can fish calm waters for this majestic species using a variety of techniques. Kuala Rompin is unique in the amount of sailfish that congregate offshore, making it ideal for fishing with bait, fly or lure. 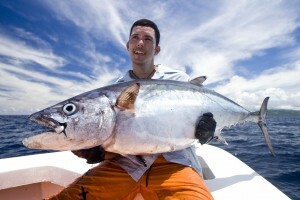 The adventures in Malaysia offer brilliant sport fishing, including resort accommodation and excellent cuisine. 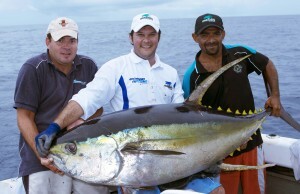 These Malaysian trips are ideal for groups of any size looking for the ultimate in calm-water sport fishing. Ocean Blue Charters started in Vanuatu with the first professional charter operation… After more than 15 years, we have branched out across South East Asia and the South Pacific allowing anglers experience some of the most remote fishing destinations in this region. Ocean Blue Charters have have exclusive access to locations that are rarely fished by other anglers. Each of these locations is perfect for the adventure of a lifetime. Our team are experts and can plan your dream expedition, whether it be casting poppers over a coral bommie, trolling for XOS Billfish, stripping a fly across an untouched aqua lagoonstripping a fly across an untouched aqua lagoon or jigging a remote seamount.